It would seem that it could be easier than hiking inShop for the purpose of purchasing any ready-made soap, and even with your favorite fragrance? 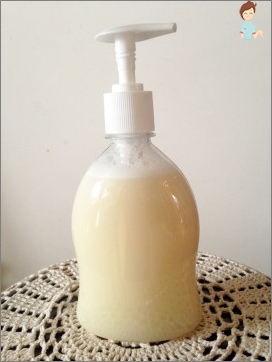 It's really easy, but if you are a creative person and like to do something with your own hands, it's time for you to learn how to make liquid soap yourself at home. This process is simple, but interesting. Probably everyone will be able to cope with self-soap making. By the way, many women even manage to earn on this, creating their own, even small, but business. 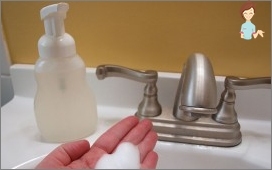 Why do liquid soap yourself? Many people seem to be saving on small thingsInefficient, and therefore the production of soap at home is considered by many to be an inexpedient venture. In fact, in many cases it is this kind of savings that allows a part of the family budget to allocate some more useful things. Products can be prepared both from scratch, and from ready-made raw materials. Even if this idea was not initially interestedYou, do not rush to get rid of the remains of soap - you can do it at any time. Perhaps, the desire to independently make a product of remnants will come to you suddenly, and raw materials for this you will already be ready. Using a grater, grind the remnants. You can use a knife and make a shaving from them. Then we send it to the selected container in such a way that it fills about 2/3 of its volume. In the process of grinding, remember that the larger the chips, the more time it will take to dissolve it. Now, fill up the jar with hot water, cover it with a lid, and then shake it well. Leave the mixture for a while - made by youLiquid soap from remnants will be ready as soon as the chips are dissolved. This may take from one to several days. Sometimes the process takes about 12 hours. To have the remedy you have been useful for your hands, add a nourishing cream. In addition, the product can be added milk,Vegetable and essential oils, which will allow him to find a new smell. To make your masterpiece even more useful for the skin, enrich it with extracts from various herbs. If you were preparing the product not in a bottle with a dispenser, it is advisable to pour it there - so it is more convenient to use it, besides it is hygienic. The technology of manufacturing the product is very simple -It is the same as described above. But modern housewives contrived to produce a multifunctional product from household soap - it can also be used for washing dishes. For modern means, substances that can cause allergies and a number of other diseases, including dermatological ones, are used. This product does not cause allergies, because forIts manufacture practically does not use chemicals and compounds (dyes, fragrances, preservatives, surfactants, due to which detergent foams). If you want to make a liquid soap, which you can also wash the dishes from the household, read how the procedure is done. Knife (or on a grater) chop the product intoShaving. Now fill it with hot water (about half the total volume) and send it to the microwave for melting. 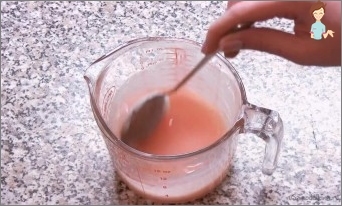 If you do not have it, melt the mixture in a water bath. Periodically stir the mixture and graduallyAdd the rest of the water. When the chips are dissolved, leave the mixture for a while, so that it cools down a little. Then add all the other ingredients to it and stir well. The consistency of the liquid must be uniform. Oils, dyes, flavors in our handmade soap are not worth adding, because it should be environmentally friendly. With mixing, foam may appear, which must be collected, and then allow the mixture to cool. Then we pour the liquid into the bottle with the dispenser. The resulting remedy may first seemToo liquid, but when it cools down it thickens, resulting in a thick enough soap, easily laundering grease and other contaminants. Glycerin will protect your hands from dryness. When using the product, a lot of foam is obtained, but it is washed off well. Most likely, this homemade soap will beConsumable faster than detergents purchased in the store. Nevertheless, taking into account the low cost of household soap and the fact that about 4 liters of detergent can be made from 1 bar, the conclusion suggests itself - this approach is much more economical. If in previous technologiesUse already ready-made basis for the product, then in the manufacture of funds under this recipe, you can feel yourself a real expert, because you have to do everything yourself from start to finish. We will need alkali and oils (preferably odorless). Pots used for a water bath. 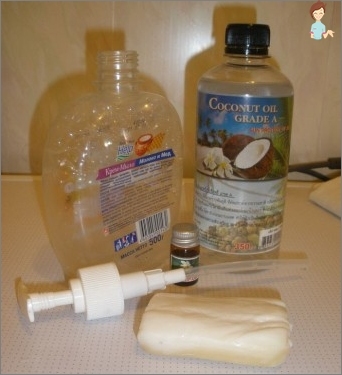 Here's how to make liquid soap at home using the ingredients and tools listed. We are waxing wax and solid oils with a water bath. Next work with alkalis, so you need to lay the table with an oilcloth, put on your hands gloves and put on an apron, so that this substance does not get on the skin. In a saucepan of cold water, dip a jar of liquid. There, add a little alkali. It is important to take into account that simply pouring a substance with water can not be done - this can lead to an explosion. Next, mix alkali and oils, which mustHave the same temperature (determine this figure by hand, and better - using a thermometer). Whisk the mixture through a blender, it should get the consistency of sour cream. Now we add essential oils to the mixture. Also at this stage, add all the ingredients that you want (clay, dyes, fragrances, etc.). The making of soap with own hands endsDecomposition of the mixture into molds. We wrap them with warm clothes and allow them to cool and harden within 3 days. After this time, we remove clothing and send the product for a month to a cool dark place. This technology is also very simple and does not require special skills. When the product is prepared from remnants, it is rubbed, boiled, and dried. The same is done with a bar of the whole product. 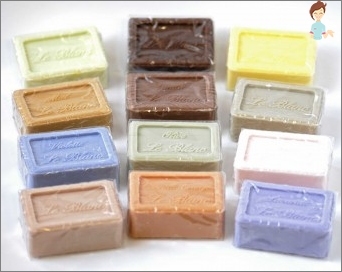 To make a simple soap liquid, which can be used as a shower gel, use moisturizing raw materials. Knowing these technologies, you can not only save money, but also show imagination by adding various additional ingredients to the products, giving them a new color and aroma.